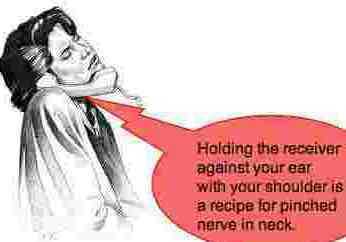 Pinched nerve in neck could be coming from your telephone posture. 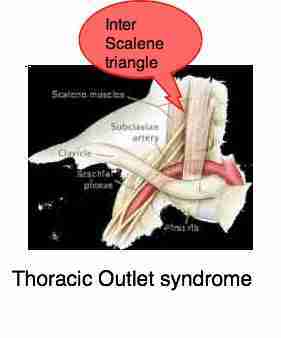 Keywords; pinched nerve in neck, cervical facet syndrome, thoracic outlet syndrome, neck pain and headache. Do you spend long hours on the telephone? Or, do you regularly have to type on the computer, or write notes, whilst on the telephone. 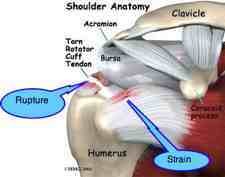 Raising your shoulder to hold the receiver against your ear is a common cause of pinched nerve in neck. Just one look at the poor woman above will explain why she has neck pain and headache. The posture is so obviously gross. Whilst doing this for a few minutes a day is probably not a problem for a good neck, if you have had an injury, or whiplash to your neck, even a few minutes could bring on a headache. Strange as it may seem I still see many office workers holding their phones in this manner. It's a recipe for neck and arm pain. What's more it's not rocket science; this is the study of ergonomics. Making the workplace more friendly and less conducive to injury is not only in your interests; time off for illness hurts the boss too. So don't feel embarrassed asking for assistance in getting your computer set up correctly; do your fingers point up or down on the keyboard for example? Good posture at the office helps keep you out of pain and on the job; better than visiting the chiropractor for a pinched nerve in neck, eh? You'll have to pay for that. Mind you, if you can prove that not having a headset is the cause of your injury, then he will have to contribute. Much better than all the stress is simply to have your office properly set up; less money too. What about arm pain? A pinched nerve in neck may also cause pain and tingling in arms and hands which may be even more serious than the various neck syndromes and headache. 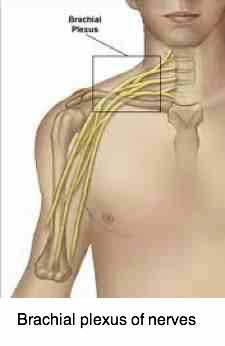 Irritation of the nerves supplying the arm is one of the common causes of the stubborn shoulder, elbow and hand syndromes like carpal tunnel syndrome that frequent your local chiropractor's office. 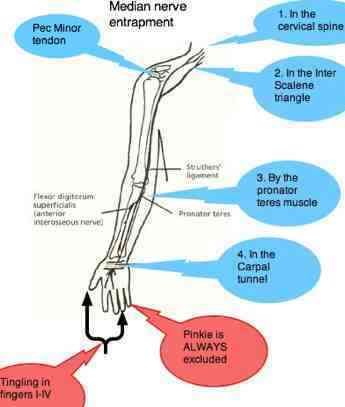 This simple test for a pinched nerve causing arm pain may be done at home, though the interpretation of the result may be difficult. A headset costs little more than one chiropractic treatment. One of these will save you thousands of dollars; alas your chiropractor won't be able to go on that skiing holiday this year. Nor will the surgeon you may be consulting if you continue to hold this seriously abnormal posture. 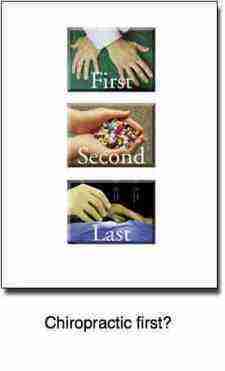 I'm joking, of course, but I hope you get the drift; an ounce of prevention is worth a pound of cure. And poor posture of one sort or another in the workplace is the cause of many of the nuggety problems we treat; if the cause remains, then we are only providing a chiropactic bandaid for the problem. Look to your computer station; think about your posture in the car or truck. You can buy that headset here from Amazon. Between the vertebrae are three main joints. 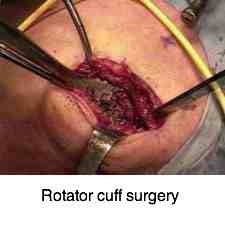 A weight bearing disc, and two facets that control how far you can turn and twist your neck. Tilting the head to the side for long periods can trap a portion of the capsule causing severe cervical pain. Because the foramen where the nerve exits from the spine lies just in front of the facet joint, any fixation and irritation can affect the nerve causing pinched nerve in the neck. 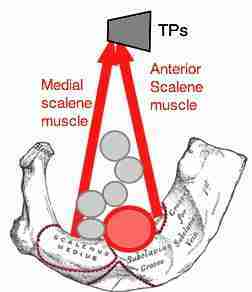 Raising the shoulder is done in part by the scalene muscles, which also raise the first rib. 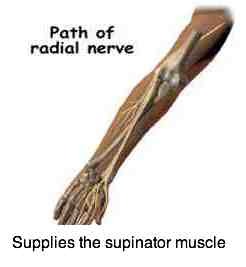 This may entrap both the artery and the nerve bundles passing by on their way to the arm. 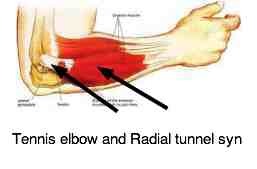 This causes tingling and if prolonged pain and numbness in the upper extremity and especially the hand. 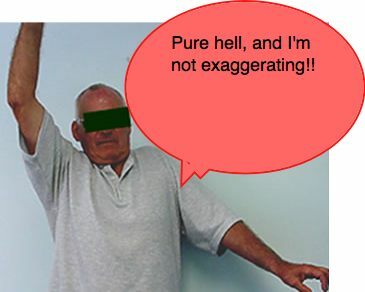 The classic symptoms are a worsening of the pain and tingling in the arm on raising it above your head, as in hanging washing, and the loss of the radial pulse in the forearm in a difficult and subjective examination known as Adson's test. 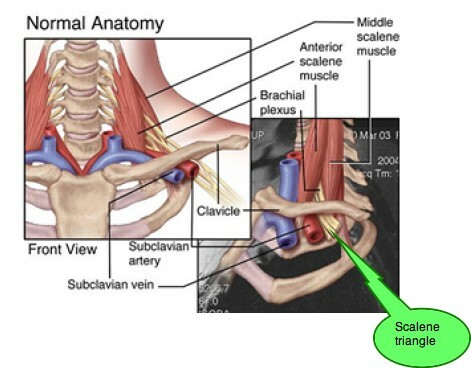 I stated above that there are in the main three joints between vertebrae. 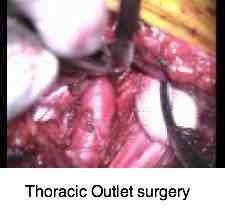 In the neck there are two additional joints of Luschka. These are frequently injured in a whiplash type injury, particularly an accident from the side. 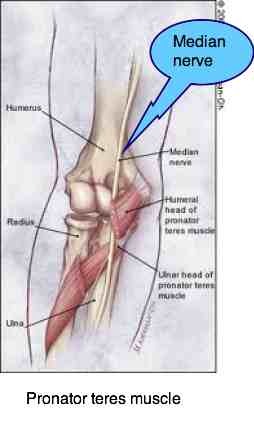 These little joints lie immediately adjacent to the foramen. 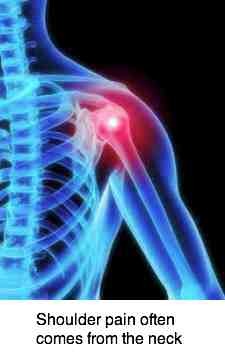 Any arthritic enlargement of these joints threatens the nerve, particularly if the neck is in lateral flexion, as when you hold the receiver between your head and shoulder. 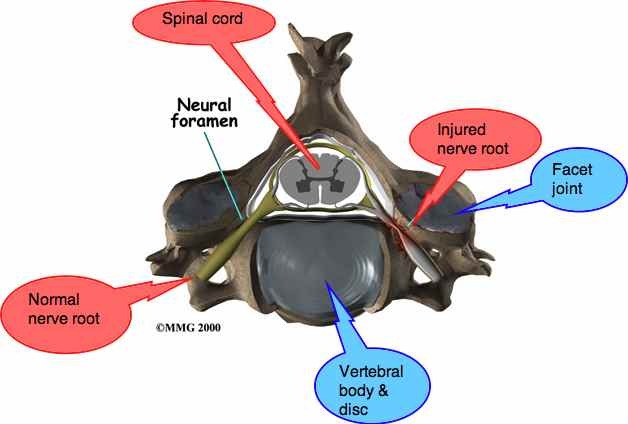 In the lower cervical spine there are an extra pair of joints that help to stabilise the neck further, and prevent a herniated disc from entering foramen where the nreve root emerges from the spine. However, it is injured it grows arthritic spurs which they then invade the foramen; that's why we recommend that every whiplash is evaluated by your local chiropractor. And especially if you've been T-boned.